91outcomes.com: RAND: Chemical Weapons in Syria: What Could the U.S. Do About Them? RAND: Chemical Weapons in Syria: What Could the U.S. Do About Them? As Daddy Warbucks once observed, “You always have to skin your own skunks.” Perhaps this insight is particularly appropriate if the United States adopts the elimination of chemical weapons as a goal for involvement in Syria. At the close of the First Gulf War in March 1991, U.S. soldiers inspecting Bunker 73 at Khamisiyah found only some 122mm rockets, presumably with high explosive warheads. The soldiers set demolition charges that collapsed the bunker and inadvertently released sarin and cyclosarin nerve agents from some of the rockets. 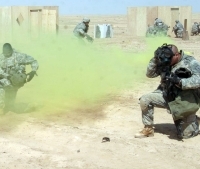 Other American soldiers downwind of the site may have been exposed to the chemical agents, producing lingering health effects. This event, along with its possible health consequences, was one incident in what came to be called the Gulf War Syndrome controversy. 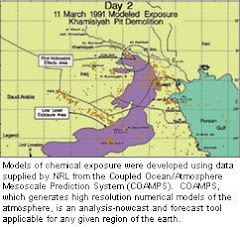 Much later, the Persian Gulf War Illnesses Task Force caused the Central Intelligence Agency to prepare a report — Intelligence Update: Chemical Warfare Agent Issues During the Persian Gulf War — issued in April 2002 that in describing the background of various chemical releases analyzes the effects of Coalition attacks on chemical weapons in 1991. Even though this report is now more than 20 years old, it demonstrates how difficult it would be to attack Syrian chemical weapons today. As the CIA report shows, the soldiers at Khamisiyah did not recognize the 122mm rockets as chemical weapons because they were not marked. Chemical weapons — aerial bombs, artillery or mortar shells, or artillery rockets — look pretty much like their high-explosive brothers in size and shape. The primary distinguishing features are usually colored bands or stenciled markings. We expect to find such markings because ever since World War I (when chemical weapons were first introduced in modern warfare) countries have used markings to prevent accidents in handling. Saddam Hussein's Iraq did not routinely mark chemical munitions (apparently relying on paper manifests): Iraqi chemical weapons were virtually indistinguishable from the hundreds of thousands of outwardly similar high-explosive rounds that filled ammunition bunkers. Finally, the report also shows that the intelligence community's pre-war belief that chemical weapons were associated with particular types of storage facilities was mistaken. Moreover, the Iraqis attempted to evade Coalition air strikes by moving munitions from known storage locations — sometimes into the open — and burying some bulk storage. These evasions were largely successful. The CIA assessed that “most chemical munitions were missed by Coalition aerial bombing” and that Coalition bombing had released less than 8% of the more than 700 tons of chemical weapons and bulk agents later found by the U.N. Special Commission supervising Iraqi chemical weapons disarmament. 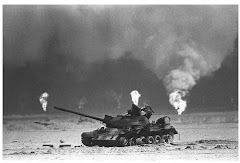 In the period after the First Gulf War, the U.N. Special Commission and its successor the United Nations Monitoring, Verification and Inspection Commission supervised the disarmament and destruction of Iraq's chemical weapons. They discovered that large quantities of chemical weapons and precursor chemicals had survived the war, and that their destruction would entail a major industrial operation. Iraqi engineers, scientists, and technicians — still working for the Saddam Hussein regime — carried out the actual work of destruction under supervision of the U.N. specialists. The Iraqi workers were precisely those who had created the weapons in the first place and knew what they were dealing with. Coalition bombing had only damaged, not destroyed, key components of Iraq's chemical weapons production infrastructure that could be used for disarmament, such as the Iraqi sarin plant that was converted to a hydrolysis plant for destruction of the nerve agents and their precursor chemicals. This was a stroke of luck in dealing with hundreds of tons of the most dangerous materials. In addition, a wholly new incineration plant was designed and constructed for mustard gas and its precursors. Finally, those chemical munitions and bulk agents that had been damaged by the Coalition strikes and rendered too dangerous for safe disposal were entombed in bunkers at the Al Muthanna site. This work was not completed until May 1994 — more than three years after the war ended. At a minimum, this means that infrastructure useful for disposal should be identified and kept off target lists. Unlike the Iraqi situation, in which regime loyalists could be used to carry out the destruction work under supervision, the planning, manning, and training for Syrian chemical destruction will need to be based on external sources. And finally, it will take several years — as it did in Iraq — to accomplish the destruction. During that time the material must be adequately secured by reliable forces. This commentary appeared on The RAND Blog and GlobalSecurity.org on May 21, 2013.